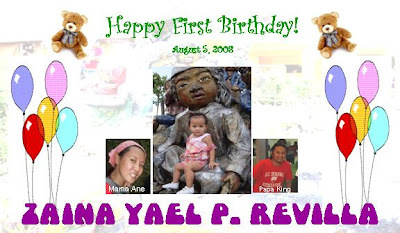 I scanned over the Davao’s telephone directory to find several venues to host my little girls birthday. Its not easy to find them. I may have find some but considering the budget and and the accessibility. I even had research on the net, hoping to find ideas. Despite the effort, still had none to consider. Until considering my aunts suggestion to hold it at Geojoe’s Restobar, located at ecoland drive. We filled the place with balloons designed like flowers with stem. And scattered some of them on the floor so the kids can play with them. I designed it using the Microsoft power point and saved it as .jpeg but when I had it printed the printing press said that images will be distorted so I have to make new lay-out, I dont know how to do it on Adobe Photoshop so I went to nccc mall at reppapepz stall as per anne’s advice. The following day Anne and I went out to canvass for some cheap printing and were adviced to pick up the tarp the next day. Some unexpected things happend. The shop was attack by a virus and so files were deleted. In short, tarp was not printed. hhahahah hayyyyy to make it short just the day before the big event we finally had a wonderful tarpulin. We bought some shot glasses then fill it with silver dust, cotton and some stars origami. then covered it with corrugated paper and pasted Zaina’s thank you message. Cake was ordered at Goldilocks four days before her birthday and then we just picked them up. II hired a clown to make the event more fun. He had balloon twisting, magic tricks, the puppet show and the games.